Pussac Punay... Chilean Heritage Beans from the Peruvian Andes, is made up of about twenty similar varieties that have the same growth cycle and have been planted together for generations. 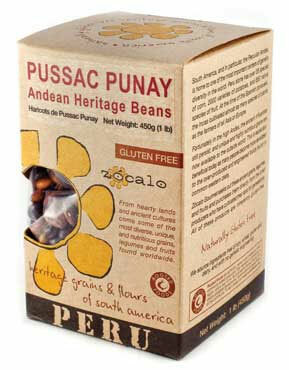 In Quechua, the native language of the region, Pussac Punay means the �sleeping eight� for each pod contains eight beans. The beans are grown in the remote Huancalavilca region, east of Lima, between the altitudes of 7,000 and 10,000 feet, by an association of small farmers using organic cultivation practices. The farmers grow maize along with the beans in a symbiotic relationship where the corn stalk becomes the beanpole. Preparation: Soak the beans for 6-8 hours in fresh water. Drain and cook until tender. Wonderful in soups, salads, casseroles, or even baked. Firm and flavorful!